Prof.Prem Kumar Dhumal,Chief Minister,Himachal Pradesh launching National Rural Employment Guarantee Assurance Scheme (NREGA) in remaining eight districts of the State from gram panchayat Chamiana in Mashobra developmental block of district Shimla today.Theindiapost Photo : Anil Dayal Prof Prem Kumar Dhumal, Chief Minister today launched the National Rural Employment Guarantee Assurance Scheme (NREGA) in remaining eight districts of the State from gram panchayat Chamiana in Mashobra developmental block of district Shimla today. 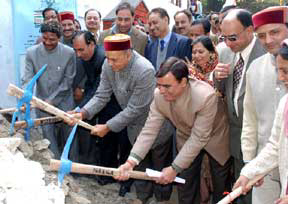 Addressing the launching ceremony at Bhatha Kuffar, near Shimla, Chief Minister said that the State would consider making adequate provisions of legislation to hold direct elections to the office bearers of Zila Parishad, Panchayat Samiti, Gram Panchayat and Urban Local Bodies with a view to provide stability to the grass level units of democracy and help them function in a more democratic manner for the development of respective areas for their full term. He said that all related aspects would be examined and possibilities would be explored to conduct direct elections to the various positions which were presently being elected by indirect elections. Prof. Dhumal said that the State Government had decided to appoint 1,181 Gram Rojgar Prerak under the NREGA to create awareness amongst the people about the benefits of the scheme so that maximum people were brought under the fold of the scheme and hundred days assured employment provided to the job card holders. He said that each Gram Rojgar Prerak would look after three gram panchayats of the area thereby covering all 3,243 gram panchayats of the State. He said that 1,181 rural youth would get benefited with the employment in their respective areas. He added that the Takniki Sahayaks had been made joint signatory alongwith the Pradhan of the respective gram panchayat to assess and complete the codal formalities for clearance of payments for various developmental projects worth Rs. 1.5 lakh. He said that the service fee to Takniki Sahayaks had also been fixed at 2 percent for works upto Rs. 50,000 and 1.5 percent for projects valued between Rs. 50,000 to Rs. 1.5 lakh. He said that the Government was committed to empower the gram panchayats with more powers so that they could function more effectively and independently for speedy development of their respective areas. Chief Minister said that the State Government had decided to provide 50 percent reservation to the women in all the panchayati raj institutions and urban local bodies with a view to provide them fair representation in the democratic system and to take benefit of their progressive attitude towards the speedy development of respective areas. He said that the earlier experience of providing 33 percent reservation to women in all such institutions had been successful and women had been contributing significantly towards the development and welfare of the people of the area they represented. He said that the budgetary provisions for the current financial year to Panchayati Raj Institutions had been enhanced from Rs. 87 crore during previous financial year to Rs. 121 crore, registering an increase of about 50 percent. He said that the State Government had also enhanced the honorarium of all the members of the Panchayati Raj Institutions soon after coming to power in the State. interiors of the State so that maximum people were benefitted by the programme. He appealed to the representatives of the panchayati raj institutions and local urban bodies to educate people about the programme which aimed at providing employment to the rural people within the radius of five kilometers wherein women were eligible for additional benefits. He also appealed to the rural youth to take benefit of the scheme and get them registered by obtaining the job cards from the competent authorities. He directed the authorities responsible for implementation of the NREGA to work more dedicatedly and publicize the scheme amongst the people for its wider coverage so that every eligible person was brought under the fold of the programme. Chief Minister distributed job guarantee cards to the eligible persons of Mashobra Development Block and unveiled the stone at Chamiana village. He announced Rs. 5 lakh for the Government Senior Secondary School building, Bhatha Kuffar and Rs. 3 lakh for the completion of Chamiana irrigation scheme. Shri Narender Bragta, Horticulture and Technical Education Minister said that the policies and programmes of the State Government were focused on the rural development and the rural areas would get prosperous with various schemes envisioned for the development of such areas. He said that Himachal Pradesh had an agrarian society and major chunk of the population was dependant for their livelihood on agriculture related activities. He said that diversified farming was being encouraged to generate additional income to the farmers. Dr. Srikant Baldi, Secretary, Rural Development, detailed the provisions of the NREGA and termed it revolutionary for strengthening of the rural economy. He said that the scheme would be instrumental in checking the migration of rural unemployed youth to the urban areas in pursuit of employment. He said that women empowerment was one of the other important aspect of the scheme which was being encouraged for uniform representation to male and female in the prevailing system. Shri J.S. Rana, Deputy Commissioner, Shimla, said that machinery had been geared up to meet the challenge and implement the scheme in letter and spirit in the entire district. He said that process to prepare job guarantee cards was being completed expeditiously so that benefits were made available to the targeted people as early as possible. Shri Prem Thakur, Pradhan, Gram Panchayat, Chamiana, welcomed the Chief Minister and apprised him of the various demands of the gram panchayat. Chief Minister was also presented a draft of Rs. 5100 by Dhalli Sudhar Sabha as contribution towards the Chief Minister’s Relief Fund on the occasion. Shri Sohan Lal, MLA, Smt. Chander Prabha Negi, Chairperson, Zila Parishad, Shimla, Shri Khushi Ram Balnahta, General Secretary, State BJP, Smt. Roopa Sharma, President, Mahila Morcha, Shri Ganesh Dutt, President, District Shimla BJP, Shri H.N. Kashyap, Secretary, State BJP, Dr. Arun Sharma, Principal Private Secretary to the Chief Minister, Shri J.R. Katwal, Director of Information and Public Relations, Shri Pradeep Chauhan, Economic Advisor and other prominent people of the area were present on the occasion.